“How would you explain the benefits of dairy automation to consumers?” If you know the answer to this, you may be interested in applying for the Future of Dairy Scholarship Program. We are proud to once again present the Future of Dairy Scholarship Program sponsored by Lely North America. In the program’s second year, five qualified students residing in the United States and/or Canada will be chosen to receive a one-year, $1,000 scholarship. 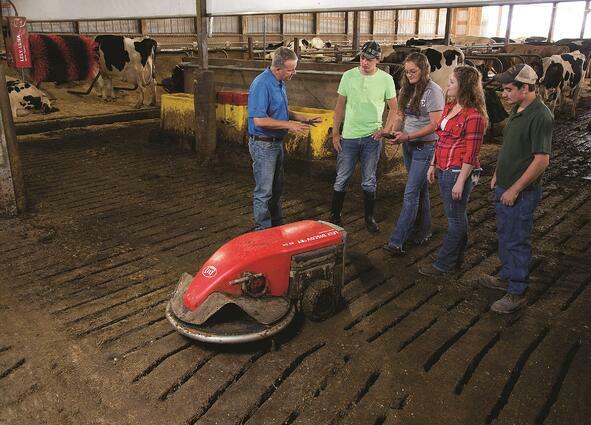 To qualify, students must be enrolled at an accredited junior college, college, university or graduate school, in a program that can equip them to contribute to the dairy industry. In addition they must be current or previous members of the 4-H or FFA organizations. Anyone who is interested in applying is required to submit a personal resume, provide a letter of recommendation from their 4-H or FFA advisor/leader/youth coordinator and acedemic advisor, as well as write and submit an essay response to the question above. "Today's youth have the opportunity to make an impact in the dairy industry," said Peter Langebeeke, Director of the Americas. "When selecting scholarship winners, we look for a variety of skill sets in order to help students achieve their academic goals. If you are interested in this opportunity, you may submit your application online at www.lely.com/scholarships from September 1, 2017, through October 8, 2017, at 11:59:59 PM CDT. Winners will be notified on or around November 22, 2017 and publicly announced no later than December 22, 2017.